Seth and I at the top of Poley Mountain. NOTE: This is a column I had published in a local Sussex, NB paper. I was truly impressed with the way people didn't make me feel like the amateur I truly was. I'm sure I got in the way of a few faster skiers but not one said anything and all were very courteous. For me, a non-skier, it may have convinced me to ski more frequently. I heard a lot of this through the first part of winter. 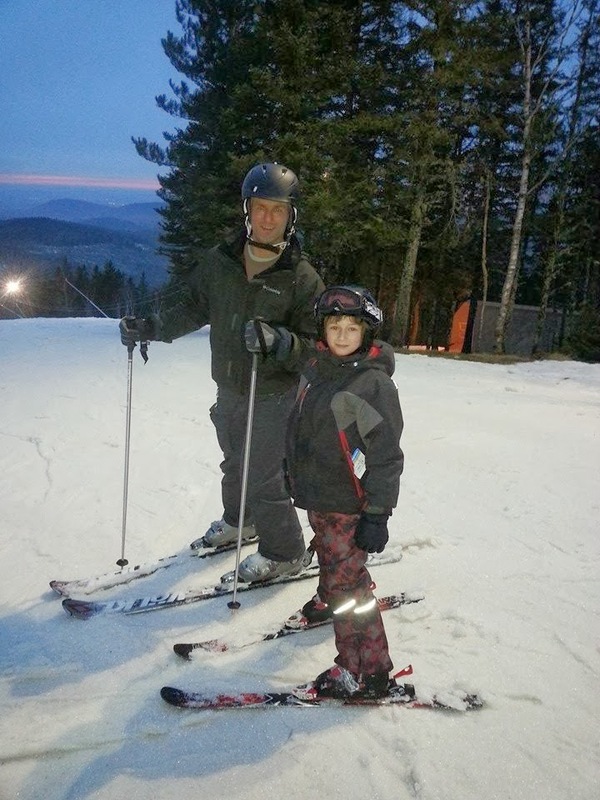 My son, Seth, was pushing my limits with his insistence that we go skiing. 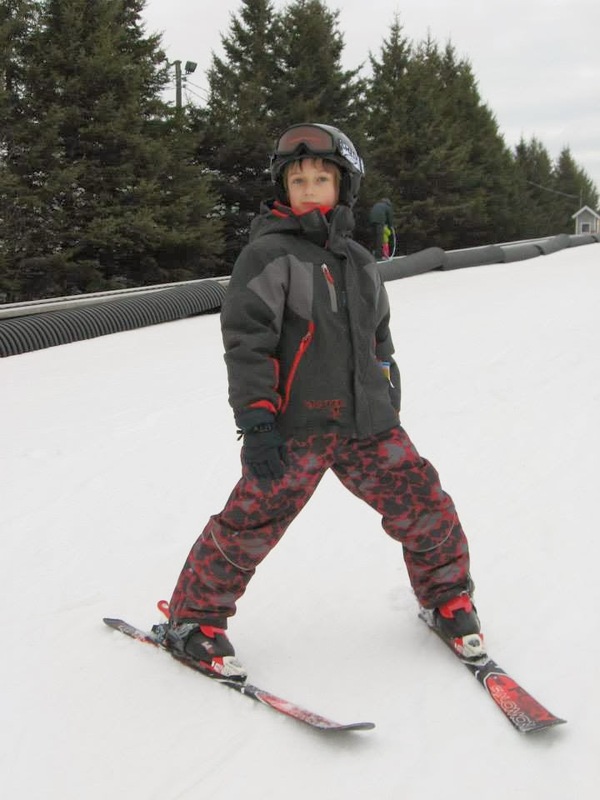 It wasn’t the fact that he wanted to go skiing that bothered me. It was the fact I’d have to go with him. The day came when I couldn’t say no any longer and my sister and I took Seth and my nephew Cole to the hill for a Saturday afternoon of skiing. With some promotional lift tickets and buddy passes our costs would be minimal and we were prepared to make the most of our day. Seth would be using borrowed gear but I had to go through the process of renting equipment. This process was much quicker than I anticipated as the staff at Poley quickly took my height and weight and used that to provide the properly sized gear I needed and adjusted my bindings so I could head out worry free. Mother Nature hadn’t been kind to the hill the previous days and that meant two first timers would have to deal with fast and icy conditions. With some trepidation I took my first steps in my ski boots and my confidence grew slightly as I didn’t fall over. The next task was to find my way to the bunny hill. Seth had already joined a couple of his cousins and had already made a few runs down the hill. Now the pressure was on me to make my first run down the bunny hill. Seth quickly adapted to his new sport and was eager to move from the bunny hill to the big hill. As John McNair, from Poley stated in a column recently, it turned out to be “Easy peasy, lemon squeezy.” I was able to manage my speed and stay upright, granted I snow plowed for most of that first trip. As I got comfortable I practiced some parallel turns and slowly built up more speed. I was just getting truly comfortable when the moment came. “Dad can we try the big hill?” At that point I was glad my sister, Becki, and my brother’s girlfriend, Lindsay were there. If we had been on our own there would have been no way I would have taken him to the “big” hill. My nerves went to another level. Now I was not only worried about coming down the hill but also getting up the hill. As we made our way over to “Some Easy” to descend to the chair lift, our challenge became real. It was super icy, or at least to me and Seth it was. Poor Seth fell over trying to avoid an ice patch and I didn’t know if he was going to be able to get back up. He struggled but got his skis where he needed them and pushed himself on his feet again. When we got to the chairlift I thought he might hesitate but I needn’t worry as he stepped up and jumped on. Getting off would be a different story. Three of the four of us on the chair collapsed in a heap as we tried to glide off the smooth ride. As better skiers easily disembarked the lift, they patiently made their way around us and thankfully no body poked fun. Supper time came and we enjoyed some live entertainment while we enjoyed burgers and fries at the lodge. The atmosphere was very friendly and I found myself feeling extremely relaxed despite being in a new setting. Just when I was ready to call it a day, Seth asked to go back out and hit the bunny hill. Since snow started to fall, I couldn’t say no and we spent another couple of hours taking trips down the bunny hill with the lights showing the way. I never pushed myself beyond my limits, matter of fact, I never came close. It was great to see that we could ski and not over do it. No one made us feel like we were holding them up or we were in their way. Honestly, I think that the next time we get a chance to go skiing, Seth and I will jump all over it. Today I took the kids out behind the house for a skate. We had a blast and I managed to take a video of Shaylee's first time skating without my help. This was her first time out this year and I bet we can count on one hand the number of times we had her out. She never hesitated and showed no fear. Once her skates were on, she was off. I thought this fit well with the story I just had published in the January 28th edition of the Kings County Record. Tuesday was very cold and I was checking the weather forecast to see what Friday would be like. I couldn’t wait for it to come. The forecast called it almost bang on, so when Friday came my countdown shifted from days to hours. The temperature rose to a warm -2°C by the evening and I met up with a buddy and headed to the snow covered hills around Waterford. Now most people, when you mention snow covered hills around Waterford, they think skiing. I was heading out to go play hockey. Grassroots, old time, pickup hockey, played outdoors, under the moon. The Waterford Youth Centre is now home to the local outdoor rink and what a bucolic winter location this rural community has created. An outdoor rink is the backdrop to a covered bridge over Trout Creek, and behind the rink is a rugged rock ridge. Oddly on this night, I didn’t even truly notice the scenery. I was there to play hockey. About 18 guys showed up to play. We threw our sticks into centre and then a couple of guys divided them up. We played hockey, 5 on 5, on gritty ice, and there were some fantastic plays and some not so fantastic plays. Some of the guys skated hard while others hardly skated but no one criticized anyone else. No one kept score and half way through we changed the teams up. Considering that I hadn’t been on skates yet this season I was a bit apprehensive at first. Once I got the puck though I pushed it a bit and then I let it go. We played for 2hours and even though I was dead tired when we stopped, I didn’t want it to end. I think I scored a couple of goals but so did everyone else so it was a great night. Playing with and against guys I haven’t played against in years was fun, and reminded me of the respectful rivalry and chemistry I had with some of them. I would try a little harder when I had a chance to face my brother one on one and I’m sure he was doing the same. After the hockey ended, no one was in a hurry to go home. Guys sat around and chatted about, what else, hockey. How the Habs were on a roll or how the Oilers were under performing. Every now and then the topic would roll to the weather or the recent party or the dreaded ice user fees in Sussex. To those in Waterford that night, that was actually a non-issue. Who really needs a full facility, especially with the weather we were blessed with that night? If you want a chance to experience the thrill of pond hockey in Waterford then get a team together and register for the Corner Cup which will be played at the Waterford Youth Centre this year. The tournament will run from February 13th to the 15th. Teams of 6 will compete, in a 4 on 4 tournament, for the wood carved, Corner Cup. Registration is $120 per team with the winner taking half the pot and the remainder going towards the Village of Sussex Corner’s “Sullivan Park Enhancement Project.” To register you can e-mail me or find me on Facebook. Coming up in my next column, I’ll be staying in Waterford.